At InsideOut Solutions, we’ve made a name for ourselves creating custom, responsive WordPress websites but you may not realize we also offer graphic design services for both digital and print media. In fact, we’ve been doing so for more than 20 years. InsideOut Solutions isn’t just about websites – we’re a full service marketing company. We know that great print and graphic design grabs attention and tells your story – and we know graphic design. Our graphic design services can help you with your logo design, brochures, product packaging, stationary, business cards, and ad work. We were recently tasked with creating back lit displays at SEATAC Airport for two local tourism entities. Jenn Lozada, InsideOut graphic designer, was delighted to provide the graphic design services. The Port of Seattle’s innovative “Spotlight Program” provides an exceptional opportunity for smaller Washington state tourism organizations to reach an international audience. The program puts various advertising spaces at SEATAC airport in a lottery system. Both the City of Port Townsend and the Olympic Peninsula Tourism Commission were recent winners. They contacted InsideOut’s Jenn Lozada to create their designs. Jenn has worked closely with both organizations for many years. She knows their branding very well and was able to tailor the designs to suit both their goals and design budgets. Jenn worked with Mari Mullen, Executive Director of The Port Townsend Main Street Program. Following Mari’s art direction, Jenn incorporated elements of Port Townsend’s current tourism theme, “Escape to Port Townsend,” as well as some beautiful area photos into the Spotlight ad. She also created a rack card, and social media/onscreen images using the same elements. 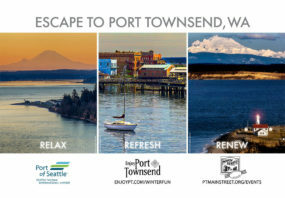 The consistent look and feel of Port Townsend’s campaign communicates the idea of “relax, refresh, renew” across a range of media. For OPTC’s Spotlight ad, Jenn worked with Marsha Massey, Executive Director of the Olympic Peninsula Visitor Bureau and her team. 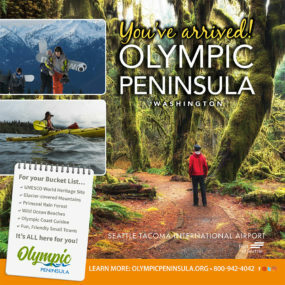 The Olympic Peninsula Tourism Commission (OPTC) is a cooperative partnership of tourism marketing entities across the Olympic Peninsula. As such, the ad had to represent the offerings of a diverse region. Jenn worked with the OPTC team to create a beautiful ad highlighting fall and winter activities throughout the Olympic Peninsula. InsideOut’s graphic design department has created print and advertising campaigns for over two decades. As many of our repeat design clients can attest, the customer service is exceptional and our pricing is very competitive. Whether it’s business cards and brochures, or product labeling and ads, InsideOut’s graphic design will beautifully communicate your message in every medium! Contact us today for a free quote on graphic design services.